Often it's the paper trail that brings down a would-be terrorist. Accused lone-wolf jihadist Jose Pimentel was arrested as he assembled a pipe bomb in his home. But he leaves an extensive collection of writings and online postings which show his devotion to waging jihad in America. New York police arrested Pimentel Saturday for plotting to bomb American police and soldiers returning from Afghanistan and Iraq, using homemade pipe bombs based on an al-Qaida magazine article, "How to Build a Bomb in the Kitchen of Your Mom." The unemployed Dominican convert to Islam answers to the name Muhammad Yusuf and is charged under New York state law with two counts of conspiracy, one count providing support for an act of terrorism and a weapons charge. News reports indicate that the FBI declined to pursue Pimentel because agents considered him "mentally unstable" and not a serious threat. But Pimentel's blog, monitored by law enforcement officials for the past year, shows sophisticated reasoning and articulate expression of why he wanted to kill Americans. It is rare that terrorists leave behind such a clear trail of their radicalization process, with detailed identification of the influences that motivated their actions. The case shows that, although the release of English-language jihadi materials has taken a hit since the September killing of al-Qaida ideologue Anwar al-Awlaki, the videos and writings he left behind still inspire terrorist plots. 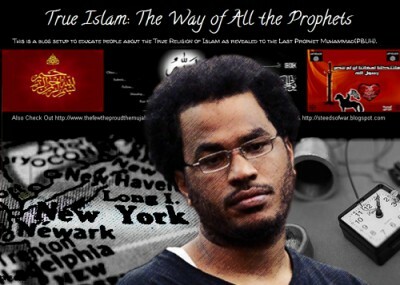 Pimentel's website, trueislam1.com, mixes radical Islamist ideology and mainstream Islam, creating the picture of an educated and dangerous extremist. His reading list includes classic commentaries of the Quran alongside radical texts, such as Muslim Brotherhood luminary Sayyid Qutb's Milestones and [Kitab al] Tawheed by Muhammad Ibn Abdul Wahhab, the founder of Wahhabism. Milestones is a highly intellectual work that develops the case for political Islam and jihad to establish a modern Islamic state, while Wahhab's theological text forms the basis for a more puritanical form of Islamic law. Posts from Pimentel's website demonstrate his ability to synthesize ideas from sources like these into clear and coherent arguments. "Any type of magic or witchcraft, belief in astrology, idol worship, grave worshipping or asking the dead or spirits, is also considered to be major shirk [disbelief through polytheism], and any involvement in it makes a person a disbeliever," he paraphrases from Wahhab's text, also recommending it for further reading. After explaining Islamic monotheism according to Wahhabism, he shows off knowledge of Abdullah Azzam's contribution to jihad theology, naming it a form of worship. "These are the five pillars of Islam, these make up all the acts of worship in the religion that are obligatory on every Muslim, excluding only Jihad," he writes. The website also indicates that Yusuf may have been radicalized almost entirely online. Many terrorism suspects, from the New York subway plotter Najibullah Zazi to the 9/11 hijackers, require the guidance or leadership of senior terrorists at some point in their decision to plot attacks. This is especially true for terror plots influenced by Awlaki, where the plotters were either in contact with him by email, such as Fort Hood shooter Nidal Hasan, or interacted with him on his blog, like Jihad Jane. Pimentel, on the other hand, appears to have drawn inspiration from the online content produced by Awlaki and other al-Qaida ideologues, and acted out his ambitions according to the blueprints found in the English-language Inspire magazine. Although he posted on the websites of other New York-based extremist groups like Revolution Muslim and the Islamic Thinkers Society, nothing in his own writing indicates he was a disciple of those groups. NYPD investigators monitored those posts "in which [Pimentel] described his support of the terrorist organization Al Qaeda and his belief in violent jihad" for more than a year before arresting him. The criminal complaint describes how Pimentel relied on Inspire magazine to guide him on buying the components for a bomb and then assembling it. Just before his arrest, Pimentel was videotaped "drilling holes in three pipes as per the bomb-making instructions in the Inspire Magazine article." Pimentel's website illustrates that, although jihad is an important part of his view of Islam, this opinion is grounded in a general understanding of Islamic theology. His posts aren't rants. Instead, they document the thinking of someone who reasoned with the world through the eyes of Islamic extremism. "The Muslim should love Jihad firstly because God commands that we love it, and secondly because it is through 'Jihad' that the laws of Allah are established on earth," he writes in one post, "Who is a Muslim?" Establishing Sharia Islamic law is essential because "the establishment of these laws is what completes the religion, the honor of the Muslims are protected through Jihad, and through Jihad God picks out those to whom he will bless with the Honor of Martyrdom." Jihad isn't just defensive war, a practice which Pimentel admits is acceptable for Muslims and non-Muslims. Rather, it is the calculated use of violence, either to protect Muslims or the offensive tactic of liberating non-Muslims from a non-divine form of government. In "What is Jihad in Islam & Why Jihad and Not War?," he even places some small limits on types of violence used, while calling for the Muslim community to do a better job supporting those who fight for Islam. "It is horrible to see that in these times the Mujahideen are labeled as terrorists and criminals by some of the same people that they are fighting to protect, and the families of the martyrs and Mujahideen do not even get any type of support from their own community," he writes. In the same post, he argues the need to counter the "pacifist" narrative of Islam. "Even though many people are converting to Islam, many of them are following a false version of Islam that presents Islam as a passive religion that does not allow any type of fighting or killing," he writes. "This state of mind would lead to the state of disunity that the Muslims are in now, and would also lead to the occupation of Muslim lands because of the lack of support from their Muslim brethren, as is also the case now. The only way that Islam can go back to its glory is if the masses of Muslims acknowledge the reality of Jihad and practice it." Other posts lay out his hatred toward American society and the military, particularly his reposting of interviews with al-Qaida's new supreme leader Ayman al-Zawahiri. He also declared Osama bin Laden to be the "Leader of the Believers" and threatened that al-Qaida's war "puts all military, political, and financial facilities that benefit the U.S. in danger." As if foreshadowing his own plot and subsequent demise, Pimentel also set up his website as a guide to everything a future would-be extremist would need. He stopped posting on the blog months before building his own bombs, leaving a huge volume of documents and his own posts as a legacy. These include ideological texts and explosives manuals, as well as non-violent educational materials about Islam. The last post, "How to Use This Blog," even states that Pimentel intends his website to be a manual for others to follow, down to converting all of his posts to printable PDFs and adding a multilingual translator. In addition, Pimentel takes the step of distancing himself from another jihadi blogger, Jihad Princess, writing that "she does not necessarily agree with all of the opinions and views that appear in this Blog." "He made some of his even like-minded friends nervous," said New York Mayor Michael Bloomberg. He noted that the plot was the 14th directed at New York City since 9/11. This article has been corrected since originally published to fix a reference to the New York subway plot. This is an excellent site and one of the best on the net for primary source documents and informed commentary. For my college studies you have so many resources and make research a lot easier. Thank you so much. Pimentel posted a reading list on his site but the link to it is dead. Could you post a copy? I've often wondered what these people read and I have to do an assignment on how these people go rotten.